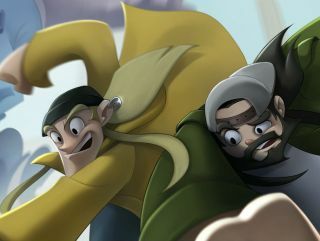 Jay and Silent Bob: Chronic Blunt Punch is a “colorful side-scrolling tag-team beat-em-up” starring, as the title suggests, Jay and Silent Bob of Kevin Smith's “View Askewniverse” fame. The game, which is the subject of the latest crowdfunding campaign on Fig, will see the intrepid duo battling their way through the new Galleria mall on a mission to discover where their once-loyal weed clientele has gone. "People have asked me for years why I never made a Jay and Silent Bob videogame,” Smith said. “Now I can tell them I was waiting for Justin Woodward from Interabang Entertainment and our own Elias to bring it together. Couldn't be happier to hand our characters off to folks who know them as well as I do." The Jay and Silent Bob: Chronic Blunt Punch Fig campaign is live now and runs until March 31.The game itself is expected to be ready for release in February 2018.